Chia Seeds: All Hype or Truly Helpful? You might have seen bags of the small black-and-white seeds popping up in the aisles of your grocery store, heard them touted by celebrities for their health benefits, or even tried a recipe yourself. Chia seeds are a hot food trend these days, but where did they come from and are they worth all the hype? Chia, or Salvia hispanica, is a species of flowering plant in the mint family that is native to central and southern Mexico and Guatemala. In pre-Columbian times, the Aztecs recognized chia as a high-energy food and cultivated it as a staple crop. They mixed the seeds with other foods and into water as a beverage, ground them into flour, included them in medicines, and pressed them for oil. In the 1980s in the West, the plant took on a zany reincarnation in the form of Chia Pets, ceramic figurines filled with soil and chia seeds that grew wild hairdos when the seeds sprouted. Today, chia seeds are growing in popularity as a food due to their high nutrient content, mild nutty flavor, and long shelf life. While not all health claims about chia have been proven in research studies, there’s no question that the seeds are packed with wholesome benefits and are definitely worth trying. · Omega-3 fatty acids, which help to raise HDL cholesterol—the good type of cholesterol that protects against heart attack and stroke. · Antioxidants, which studies have shown to be good for cells and the immune system. Just one ounce of chia seeds provides 131 calories, 30 percent of daily fiber needs, 18 percent of calcium, 27 percent of phosphorus, 30 percent of manganese, and smaller amounts of potassium and copper. It also has more omega-3 fats than four ounces of salmon. Compared with flax seeds, chia seeds provide more of all of these nutrients, can be absorbed by the body as whole seeds (not just when ground or pressed), and have a longer shelf life. Chia seeds have been touted as a key to losing weight, controlling hunger, and boosting cardiovascular health. But do these claims really hold water? As it turns out, evidence is scant that eating chia seeds will produce quantifiable results in these areas. However, eating a plant-based diet that is rich in fiber and omega-3 fats is associated with better heart health and weight loss in general. Because chia seeds are nutrient dense, versatile, and hardy, they’re easy to incorporate into your diet and a good way to eat better on the go. Even just sprinkling them into yogurt for an afternoon snack can give you a nutrition boost and help keep you fuller longer. 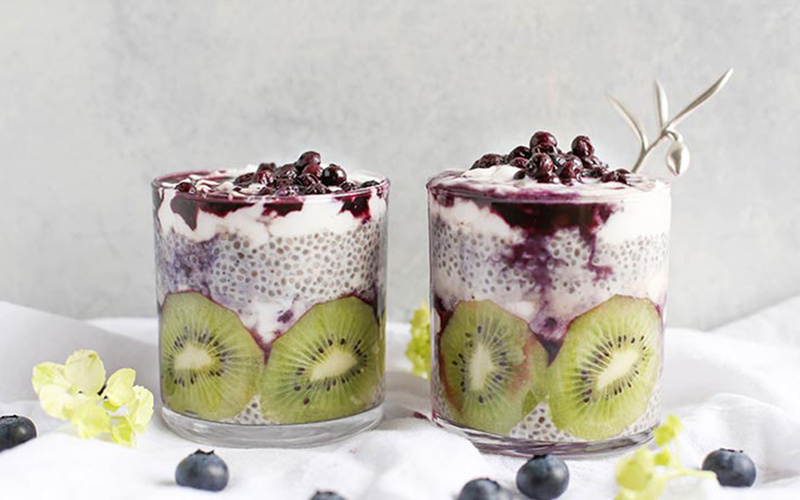 Chia seeds form a gelatinous substance when soaked in water, so they make a great pudding that is similar to tapioca, in just a few easy steps. This recipe brings together some of our favorite summer flavors. This spicy, sweet, nutty recipe makes a great breakfast on the go, or can become a sandwich for lunch. Cut the prep time from your morning breakfast routine by mixing a few ingredients together the night before and letting your fridge do the work for you. Chia fresca is a popular drink in Mexico, often made with lemons or limes. This recipe uses limes, and if you don’t mind a little crunch with your beverage, is perfectly refreshing on a warm afternoon.